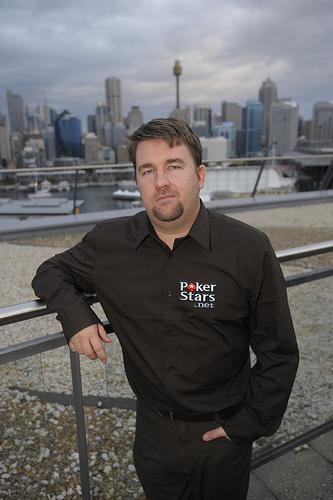 Chris Moneymaker (born Christopher Bryan Moneymaker) was born on November 21, 1975 in Atlanta, Georgia. His hometown is Nashville, Tennessee and he holds one World Series of Poker (WSOP) bracelet which he won in the 2003 WSOP Main Event. His win marked the way to what is known as "The Poker Boom", and from there on more and more people began playing poker around the world and in various tournaments. Moneymaker studied at Farragut High School in Farragut, Tennessee and afterwards got a Master's degree in accounting from the University of Tennessee. He is married and his daughter's name is Ashley. She was born only three months before he won the World Series of Poker Main Event. Prior to winning a seat to the 2003 WSOP Main Event, Moneymaker was still working as an accountant. He won a seat to the main event after winning a $39 satellite tournament at PokerStars. The interesting part, is that although he had earned himself a seat to the biggest poker event in the world, he could not afford the plane ticket or the room in Vegas. He had to sell some of his belongings to his father and his friend, promising them each a cut of his winnings. From there on, the dream came real. From winning a satellite from home, Moneymaker made it all the way to win the biggest poker event in the world, the 2003 WSOP Main Event. It was Moneymaker's very first live tournament, in which he won $2.5 million. His big win was also the turning point in the world of poker, as more and more people started believing that it is possible to win the big one, and thus every year that followed there were more amateur players in tournaments and not just the pros. One of the greatest moments in the tournament was when Moneymaker played heads-up against Sam Farha for the win. Moneymaker bluffed an "all in" with only a King high and made Farha fold his pair of nines. This move changed the momentum of the game up until Moneymaker's tournament win with his 4-5 off suit against Farha's J-10 off suit, when the board showed J-5-4-8-5 giving Moneymaker a full house and the win in the tournament. Right after he won the tournament and the $2.5 million, Moneymaker decided to quit his job and went to become a spokesman for Series owner Harrah's Entertainment and PokerStars. He also played in several World Poker Tour (WPT) events and even finished second at the 2004 Shooting Star tournament, where he won $200,000. Moneymaker often plays at PokerStars and he can be found playing there in various tournaments. He finished 6th the 2008 World Championship of Online Poker to win more than $139,000 and finished another tournament ($215 Pot Limit Omaha with rebuys) in 5th place to take home another $28,000. As of 2008, Moneymaker has won over $2,800,000 in live tournaments only. If you're still wondering by now about his last name, it is really his last name as his ancestors were making coins out of silver and gold and that is why they chose their last name to be "Moneymaker". The name did not disappoint him and it shows he's earned his last name fairly. Moneymaker is also the author of his own biography, titled Moneymaker: How an Amateur Poker Player Turned $40 into $2.5 million at the World Series of Poker.